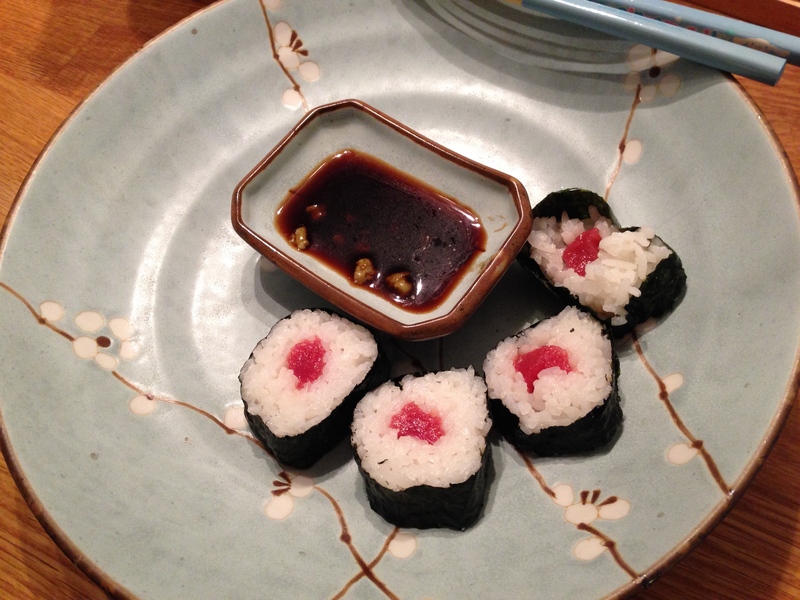 Naoto and I made homemade sushi in December. (Naoto did all of the work, but someone had to be in charge of taking photos, right?) It’s something that’s been on our to-do list for awhile, and Naoto saw a holiday sale for sashimi-grade tuna so he brought some home on a whim. 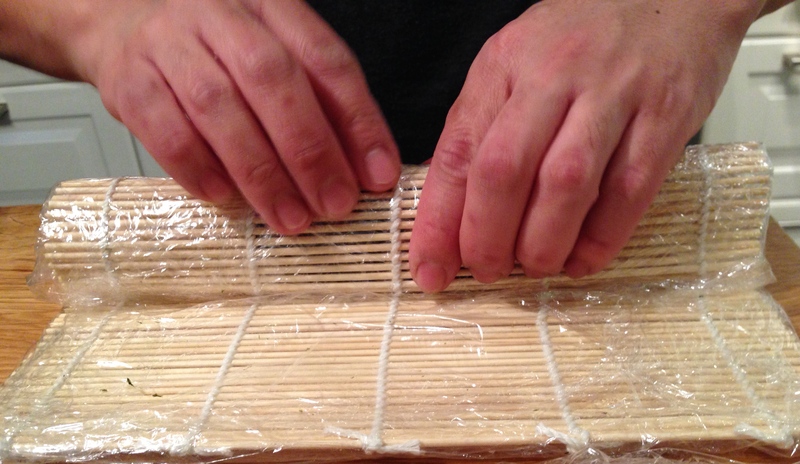 He also bought a sushi maki, the bamboo contraption that helps roll the sushi rolls. 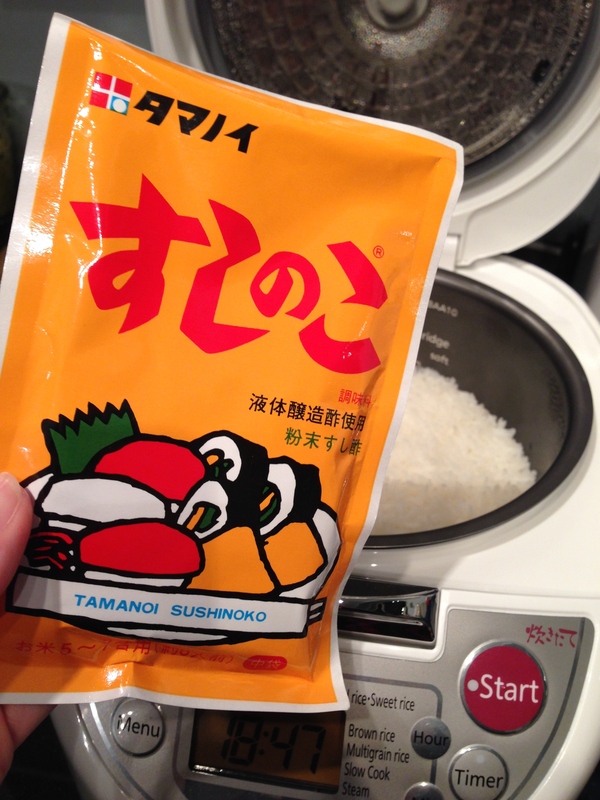 We made regular rice using our rice cooker and, once the rice was cooked, we seasoned it with sushi rice seasoning (sushinoko). All of the instructions were in Japanese but I think we used two tablespoons for two cups of rice. It gave the rice a little bit of a vinegar flavor, which apparently helps to highlight the fish. When the rice was cool, Naoto worked on the tuna. To make sushi, you have to use sashimi-grade fish. You can’t just go to the grocery store and choose any piece of fish, leave it raw and call it sushi. (This article muddies the waters…it’s unclear what determines if fish is “sashimi-grade”. I think the bottom line is…only shop at trusted places and this is not the time to be shopping for day-old specials.) Naoto got our piece of tuna from Mitsuwa, where sashimi-grade tuna is about $32/pound (regular price). Thankfully, the small piece of fish (a little larger than a deck of cards) was the perfect size for our sushi appetizer. 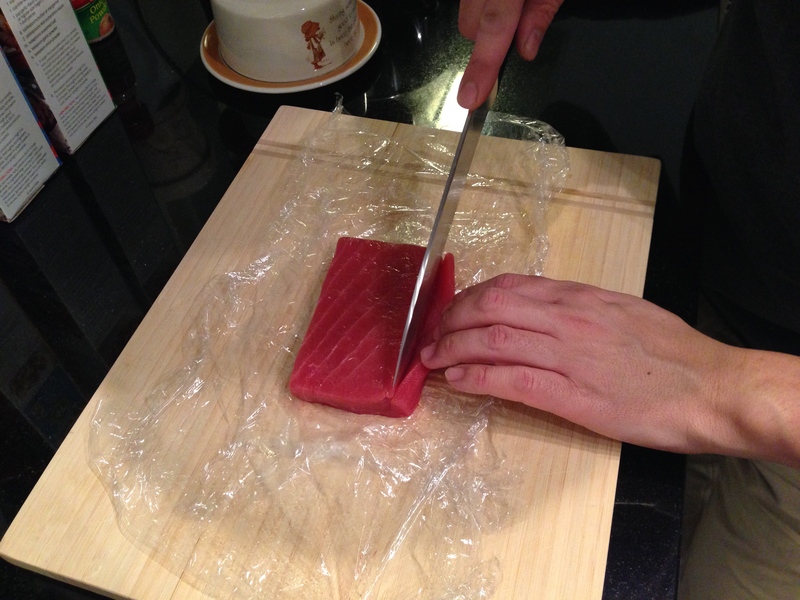 Naoto sliced the tuna into 1/2 inch pieces. 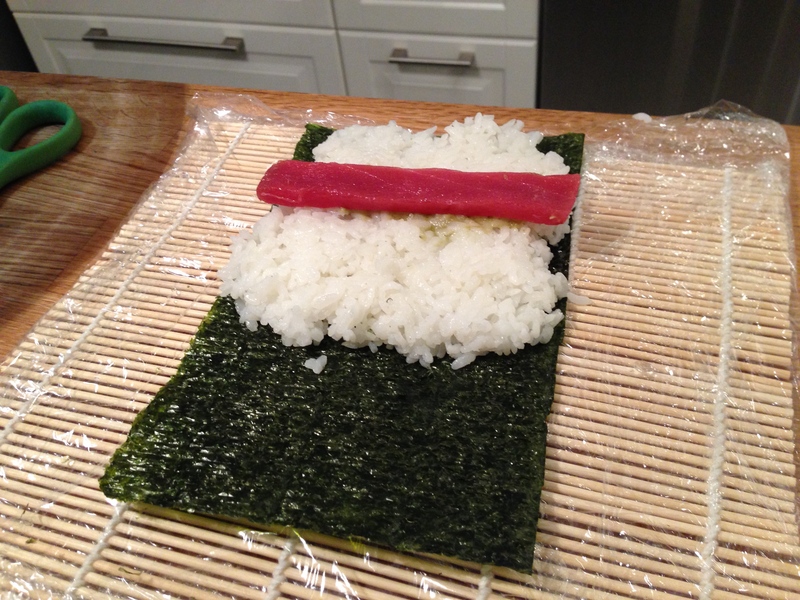 He cut the nori (seaweed sheets) into pieces just long enough to fit the tuna. Then he spread the rice, leaving two and a half inches at the top empty for rolling. (He also covered the sushi maki with plastic wrap. Apparently this is a restaurant tip to keep the sushi maki clean.) Keeping a bowl of warm water on hand to wash off the sticky rice was helpful, too. 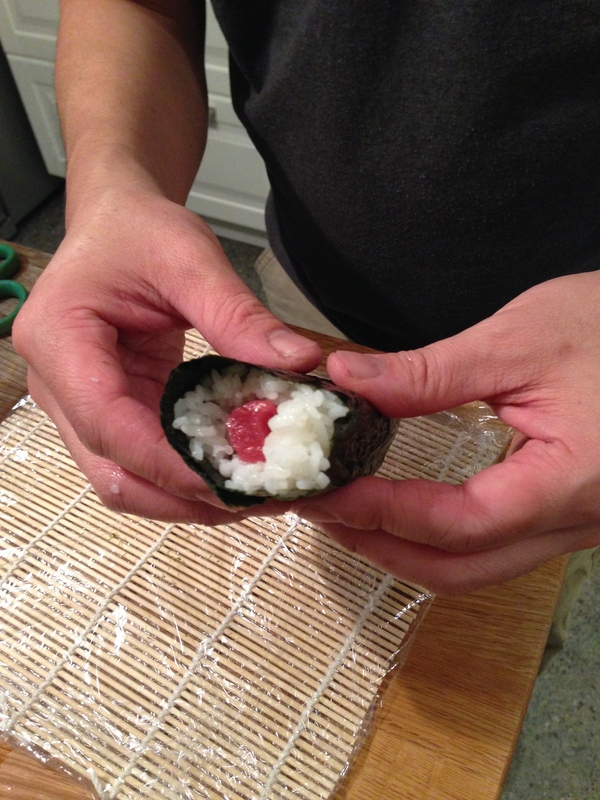 After dabbing on a bit of wasabi, he laid down the fish about one inch up on the rice end of the nori. Next, he rolled up the sushi tightly. I don’t think it was a bad first attempt, but it was hard to get the right amount of rice. Next time, we need to work on using less rice or cut thicker pieces of tuna to make up for the rice. 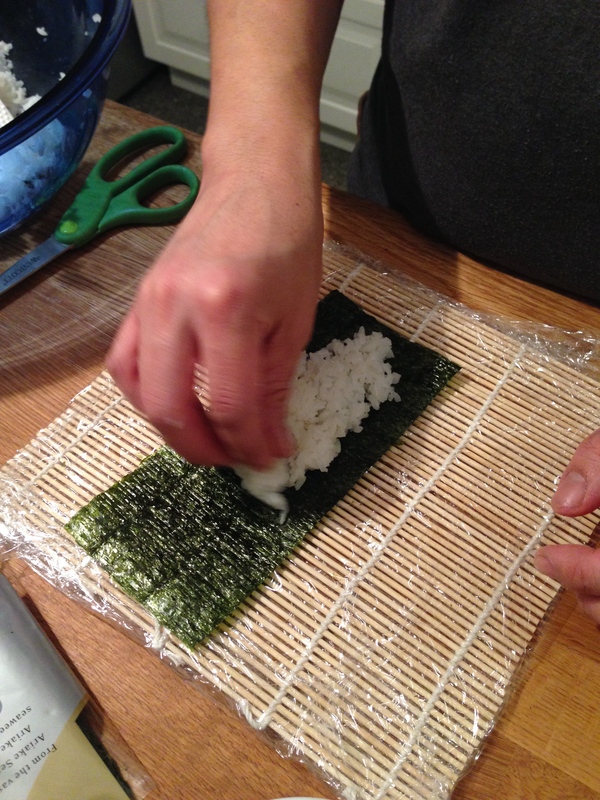 It’s definitely harder than it looks to get the perfect amount of rice and a nice, tight roll going on. Sushi chefs make it look too easy! 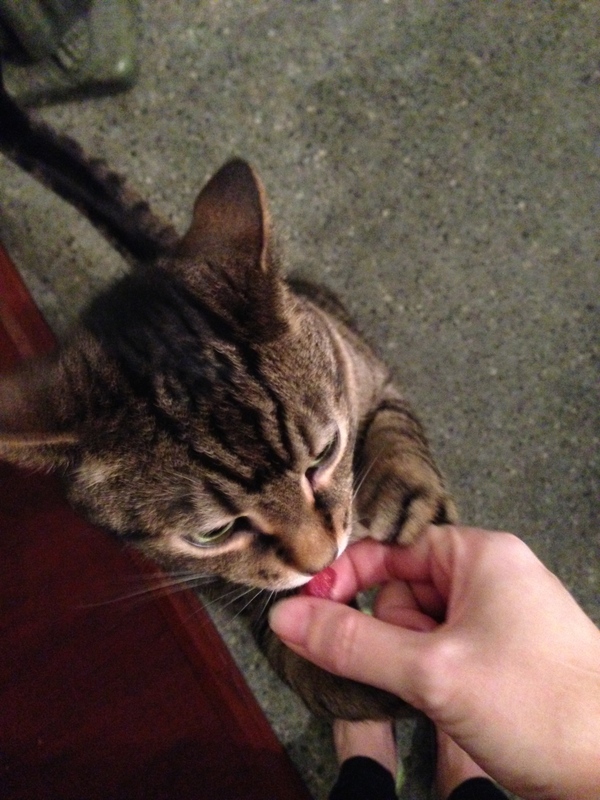 Even Presley got into the sushi action with a taste of fresh tuna. She loved it, obviously. All-in-all it was a lot of fun and a tasty experiment. I think we are going to devote a Hasegawa Happy Hour to sushi making soon, where we will add some more ingredients like avocado and cucumber and maybe another type of fish. To see the other Homemaker’s Challenge posts, go here. YUM! Also those plates are super cute. I’ve always wanted to make sushi but don’t have any sushi supplies (like the bamboo mat or nori) and the nearest Asian market is quite a walk from me… but it looks like so much fun! I definitely want to try making it some day.